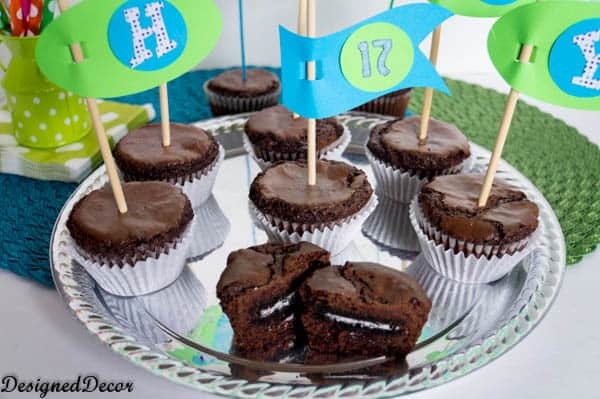 Last week was my youngest son’s Birthday, so I made him some Oreo Brownie Cupcakes to help celebrate. I had nothing planned for his birthday, I know bad mother. Friday morning, the day of his birthday, I came up with a plan. I had Oreos and brownie mix on hand, so this would be his Birthday cake. I needed to make them look festive and like I had a grand plan for his special day. I came up with the cupcake sticks idea, to spell out Happy Birthday and went looking in the Silhouette store for something that would work. I found it and made the cupcake birthday sign. I think it made a great impression, what do you think? This recipe was a very simple one. Mix brownie mix according to package directions. Line cupcake pan with paper liners. Scoop small amount of brownie mix into bottom of each cupcake paper liner. Place an oreo cookie into each cupcake opening. Place remaining brownie mix on top of each oreo cookie. Bake at 350 for 30 minutes. My son loved the Oreo Brownie cupcakes, so did his friends that spent the night. We took him out to dinner his choice and he had friends spend the night. I made them my Baked french toast casserole in the morning. I had some full and happy teenage boys when they left in the morning afternoon, teenagers stay up late and sleep in. « Homemade Toilet Bowl Cleaner! That’s one of my favorite ways to eat Oreo’s! Thanks for sharing! They look so yummy!! I’m going to have to try them! These look so yummy and would be a huge hit with my family. And funny thing, you’ll have to stop by Organized 31 on Monday to the cousin recipe to these brownies that I’m sharing. Is it Monday yet? Can wait to see them!